BTW, it’s a new application for my H1B petition. The processing time starts from the application receipt date. Did you raise a USCIS service request to know the reason for delay? Please use the processing time mentioned above to estimate your case. AM22 Estimation: We do not have enough data at this time for correct approval estimation. Please try again later. You can write your case number here in comments and i will check. Sorry..i was stuck with some other things. Will check by tomorrow. It is on my list. But Still we have not received the result on mail. We have raised the SR with USCIS on 15th April 19. After raising SR the online account got update with below comments. Question — Does this mean my H1-B extension has been denied? As per the status, it does look like your H1B application was denied. I have one more question I have another company offer can I transfer my H1-B which seems denied for extension? 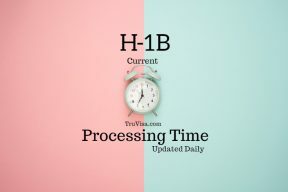 Your status will still be ‘out of status’ even if you file H1B transfer now after the denial. You would still have to leave US and wait for result outside. My H1B transfer RFE was submitted on 5th Apr19 in Vermont center. Can any one tell currently how many days premium processing is taking? Premium processing is taking anywhere between 3 to 15 days. 15 days means…is it including sat and Sunday’s? Yes, it is 15 calendar days. Your question about i539 birth date updated status has been added to our forum and answered there. My employer has received my H1B extension approval email. The starting validity date is given as 04/05/2019 but my ealier petion was expiered on 31-Dec-2018. Extension was applied on Sep-2018 and upgraded to premium in 04/05/2019. Is it an issue? Do i need to get this corrected? Can you please suggest? This is weird. Are you sure that your attorney had filled the correct extention start date on your H1B application form? Yes Anil, I did check with our attorney, he said it was filed with correct start date. The start date was prior to 31-Dec-2018 in the extension application submitted to USCIS. Some of my friends are saying, if the start date in the USCIS approval is with in 240 days timeframe then it is fine. Is it true? Do not rely on your friends suggestion. You should have extension approval to cover period immediately after your previous i94 and H1B expiry. Talk to your attorney and get the date fixed early as possible. If it is USCIS mistake, they will fix it free of cost. My H1B transfer was approved in PP on 8th of April. The attorney is yet to receive the approval notice by mail as of 15th April. How long does it usually take for the attorney to receive the approval by mail ? Is it fair to assume the transfer is approved (as per uscis website) and move to the new company or would you suggest to wait for the hard-copy of approval ? It can take anywhere between 7-21 days to get approval notice by mail. You can start working for new company if the case is showing as approved. Thank you Anil for the quick response. Appreciate it. Thank you so much. Your website is really helpful for all the applicants to stay updated with all the situations possible. You are welcome. Thanks for sharing your case update. We appreciate it. Was that Normal processing or Premium? Looking at the dates, it is a normal case. That’s correct Anil. My case is a normal processing. My H1B extn was filed in Nebraska on Dec 28 2018 in normal processing. Now in evening i have got another update on that as below. “Case Was Transferred And A New Office Has Jurisdiction”. Can you let me know , what does it mean? It means what it says. Your case has been transferred to another USCIS service center for processing. Your attorney will receive an official mail about which service center is it. Did you hear it from any Uscis new or announcement where Nebraska case is being transferring to other offices? I got my H1B approved recently( this is my first h1b approval) and my h1b was holding by an consultant. I got an offer from a company where I was working as contractor in EAD 4 months before and they are ready to take me as a permanent employee but the guy who arranged the interview is saying that i need to work for the consultant who sponsor my visa for atleast 2 to 3 pay cycle and then i can transfer my visa to the company permanently. Is it true that I need to work for the consultant ? Can I transfer my visa to the company without working for the consultant who sponsor my visa. Please advise. My suggestion is to activate your new H1B with the company who filed it by start working for them. Otherwise, the chances of RFE in H1B transfer are very high.